The application of philosophy to language study, and language study to philosophy, has experienced demonstrable intellectual growth and diversification in recent decades. Concise Encyclopedia of Philosophy of Language and Linguistics comprehensively analyzes and evaluates many of the most interesting facets of this vibrant field. 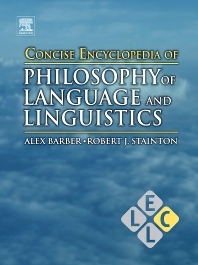 An edited collection of articles taken from the award-winning Encyclopedia of Language and Linguistics, Second Edition, this volume acts as a single-stop desk reference resource for the field, comprising contributions from the foremost scholars of philosophy of linguistics in their various interdisciplinary specializations. From Plato's Cratylus to Semantic and Epistemic Holism, this fascinating work authoritatively unpacks the diverse and multi-layered concepts of meaning, expression, identity, truth, and countless other themes and subjects straddling the linguistic-philosophical meridian, in 175 articles and over 900 pages. Relevant to any department, institute or individual interested in the philosophical aspects of language.